Ángel Sánchez-Cantalejo and Vicente Tomás were both born in Palma de Majorca - Ángel in 1965 and Vicente in 1968. Since 2002, Vicente Tomás has been a professor on the 'White' Chair (white cement applications) run by Carlos Ferrater at the Barcelona School of Architecture. 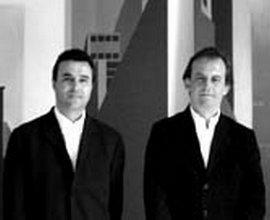 In 1995 Ángel Sánchez-Cantalejo and Vicente Tomás formed the SCT Estudio de Arquitectura. Highlights of their work include: the Museum of Modern and Contemporary Art in Palma de Majorca - Es Baluart and the site of the Balearic Islands ' Official College of Lawyers. They have won numerous competitions including: 48 state-subsidised apartments for the Balearic Institute of Housing, the Medical Centre in Ibiza, the new site of the Balearic Islands ' Official College of Lawyers, the Medical Centre in Palma Nova and the new site of the Sa Nostra Foundation. They have received recognition for their work on numerous occasions including: the Majorca Architecture Awards in 1997-2001 and 2002-2003, and the FAD (Association for the Promotion of Decorative Arts in Barcelona ) Award for Architecture and Interior Design in 2002.